Some say that Christianity undervalues or represses women. I wish those folks would read God's Word more carefully. Have you used the term, “It was worth the wait"? Well, in the Bible, women are portrayed as worthy--worthy in the eyes of God, and worth the wait of men. Let’s start at the beginning, where the first man waits for the first woman. In Genesis 2:18, God asks Adam to name the animal species. Two long-necked walkers appear. “Giraffe,” Adam says. Two chubby grey beasts. “Hippopotamus.” Two friendly four-pawed creatures with wagging tails. “Dog." Animals parade all day. All day, Adam names them. In each species, there are two animals. They eat together, frolic together, lie down together. But for Adam, there is no companion. Downcast, Adam feels his loneliness and his lack. After a deep sleep, God gives Adam a rich reward: a woman, Eve. Though she initiates the Fall, she also becomes the mother of all generations. Eve was worth Adam’s wait. Later, Abraham waits for his beautiful wife, Sarah, to give him children. God promises her a child, but Sarah laughs. She is too old to bear children. But just as God said, Sarah becomes pregnant with Isaac. Sarah’s motherood was worth the wait for such a son. Abraham’s son Isaac waits for his bride to journey from his father’s land. Their son Jacob works for seven years to earn his wives. Rebekah, Leah, and Rachel were worth the wait. Later in the Old Testament, Song of Solomon details the anticipation of a loving couple awaiting their wedding day. The New Testament begins with another strong, godly man who waits for his intended. 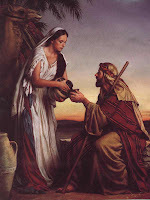 Joseph receives bad news from his betrothed, Mary: she is with child--and the child is not his. Joseph must make a harrowing choice. By rights he can cast her out, even have her stoned. But in a dream, an angel of the Lord assures him that Mary has not violated their betrothal. “Wait for her,” the angel beseeches. “Stay with her. Marry her.” Joseph obeys, then waits through her pregnancy, her labor, and her long lying-in to make her his. Mary was worth the wait. And oh, Mary’s Child! 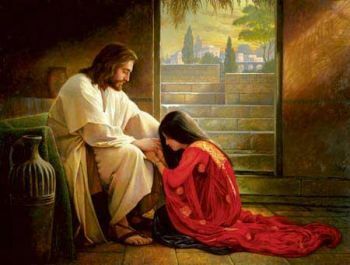 Jesus waited for women not as husband, but as Savior. He waited while men picked up stones to murder the adulteress, then He foiled the men's plans. He waited to hear from the woman who scrambled to touch his cloak so He could call her “daughter” and heal her bleeding disease. 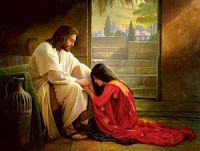 He waited while Mary and Martha served Him; He waited while the weeping woman washed His feet with her tears and wiped them dry with her hair. On the Cross, He did not die until He made provision for His mother’s care. The Bible demonstrates that women are worthy to be loved and cherished. The glorious end of the Bible underlines this Truth: Jesus, the Bridegroom, arrives to claim the church, His Bride. Broken as we are, Jesus assures us that we are definitely worth His wait--men and women alike. Gwen Stewart is a writer, elementary music teacher, and musician. She sings "Wheels On the Bus" by day and pens inspirational stories by night, pursuing excellence in both. She lives in Michigan with her husband, two children, and ten thousand of her past and present students. As always, your post is beautiful, Gwen. It reminds me of last year's ACFW conference when the theme was 'Waiting'. There's a song we sang during worship that I think was called 'We're Waiting' although I wasn't familiar with it at the time and can't remember the words right now. I'd hum the chorus but then you'd never recognize it. I remember an old Heinz commercial where they tipped a bottle of ketchup and a jingle about anticipation sang in the background. Finally at the end, a drop of ketchup poured out. That's what this reminds me of. Anticipation. We wait in anticipation of great things to come. It's not called the Rhapsody for nothing. I often get impatient with people who think the Bible is somehow anti-woman. As you say, have they ever read it? No, men and women are not the same. They were created as compliments. But it's obvious that God values each as much as the other. And men are commanded to love their wives as Christ loves the church. That's a pretty tall order, and it shows just how valued and cherished wives and women are meant to be. Beautiful post, Gwen. Thank you so much. I enjoyed it very much. Thank you all for your kind comments. 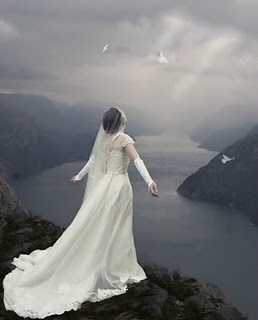 I wish the power of my words could match the beauty of the bridal picture at the end of this post. I often feel like that expectant bride...waiting, waiting for Jesus to come! May God bless each and every one of you this week. My mother always said Christianity elevated the status of women. I know many non-Christian and anti-Christian people scoff at that notion, but most places in the world with non-Christian majorities are pretty unfriendly towards women. Bradford Wilcox wrote a book (based on his research as a sociology professor at UVA) that compared men's religious beliefs with the way their treat their wives and children. Turns out the wives of practice (and practicing is key) Christian men report higher marital satisfaction than those married to non-Christians or non-practicing Christians. Gwen, Please say you'll be able to guest with us more than just in the summer! Your writing is so beautiful and your topic today was amazing. We must remember not to undervalue ourselves and it's so easy to do. Not to seek to raise ourselves above instead but to see ourselves in God's eyes. A lesson our young women need to hear day after day. I'm so blessed knowing you are a teacher, influencing students with your heart for them and for Jesus. thanks so much, Gwen! Another beautiful post. Gwen, this is a wonderful post! Interestingly, the Hebrew word used to describe God's creation of the woman is different than the word used to describe the creation of the man. The man was "molded into a form" but the woman was "built."